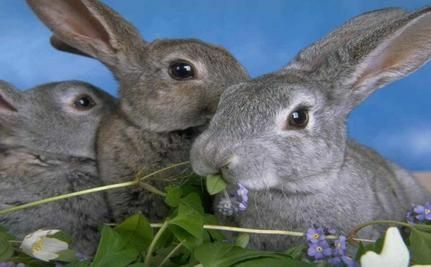 From Peta: Bunnies drowned at Petland on purpose. People… this sickens me to the core. What is wrong with people? WARNING… the following article contains a disturbing image. Please write Petland (info in article for this) and tell them what you think. Some girl who works there drowned two little bunnies, then poses SMILING for the camera (held so graciously by her MANAGER) as she holds the poor dead bunnies up. I am disgusted by this. These horrific deaths followed what was apparently an equally horrifying life for these rabbits. Other comments Carlisle posted made it clear that the rabbits were drowned after sustaining agonizing injuries when they were allowed to “attack and eat each other.” The rabbits suffered from “deep wounds all over,” “an eye missing,” what Petland staff “suspected was a broken jaw,” and paralysis from the waist down—injuries that would not have occurred had these animals been provided with proper care and supervision. Undercover investigations have revealed time and time again that companies that breed and sell animals are concerned about profits, not animals’ well-being. We are urging Petland to think long and hard about what this incident makes clear: The company has no business selling any animals. This is terrible. These people are just being downright mean!!! These animals are God’s creatures too and we’re supposed to be taking care of what He has made, not being cruel just because we can, because His animals have no voice to tell us different. I can’t help thinking, how would I feel if someone were doing this to me and my family? And what if I couldn’t even talk about it but just had to endure it…?? Like Dumbo’s mom! “If you read my previous post about the lawsuit that was filed against Ringling Bros. and Barnum & Bailey Circus, you know that the circus has long been accused of abusing elephants and other animals. Today, July 22, PETA released more evidence showing that elephants and tigers endure routine, systematic abuse of at the hands of Ringling workers. An undercover investigator from PETA traveled with Ringling’s Red Unit and saw employees digging steel-tipped bullhooks into the sensitive skin behind elephants’ knees and under their trunks. According to PETA’ investigator, Ringling employees routinely struck and whipped both elephants and tigers. At least eight employees—including an animal superintendent and a head elephant trainer—used bullhooks and other objects to strike elephants on the head, ears, and trunk. You can watch the undercover video footage for yourself at http://www.ringlingbeatsanimals.com/. The investigator also saw animals exhibiting stereotypical, neurotic behaviors. One elephant, Tonka, showed signs of severe psychological stress but was nevertheless forced to perform night after night. Following the investigation, PETA filed a formal complaint with the U.S. Department of Agriculture, alleging that Ringling and its employees repeatedly violated the Animal Welfare Act. PETA is calling on the agency to seize the 11 elephants currently used by Ringling’s Red Unit and place them in an environment where their physical and mental well-being are protected. PETA also filed a criminal complaint with the ASPCA, as well as other law enforcement officers and prosecutors in seven states stretching from Alabama to Rhode Island. In addition, PETA filed a U.S. Department of the Interior compaint about Ringling’s mistreatment of endangered animals. That’s what PETA has done—now what can you do? For starters, please personalize and send an automated message to Secretary of Agriculture Thomas J. Vilsack, urging him to seize the 11 elephants used in the circus. (The message can be found at http://www.ringlingbeatsanimals.com/.) You can also send an automated message to New York City officials and Taconic Investments to express your disappointment that they are allowing Ringling Bros. to perform in Coney Island this summer. My new interest, making tags and siggies for myspace, facebook, etc! I have just got started with this… I messed around with it some a few years ago but life happened and I got busy with other things. Recently though, I have gotten re-interested in it and I made my first ones. I just HAVE to share them and show them off!! LOL So please check my TAG/SIGGY page and if you see some you like, let me know and I will send you the link for them. Don’t just save because it will lose the animation effects!